I’ve been a wedding photographer for 13+ years, but one thing I’ve never done is hired a wedding photographer, myself. That means we’re basically in the same shoes! Hashtag twinsies! So in case it helps, and drawing from my inside knowledge, these are the questions I’d ask if I were hiring a photographer for my own wedding. May I see a full wedding, please? Are you insured for my event and venue? How will you approach the dreaded group formal portraits? Will you be able to make my fianceé look as beautiful as she deserves? What’s your wedding day personality like? How will you publicize the images afterward? Will our digital files be edited and print-ready? A photographer’s portfolio is filled with their proudest work. Photos from when everything went right. When everything was perfect. But spoiler alert: wedding logistics aren’t perfect and, more often than not, my job is to make the least-photogenic locations and situations look like magic. Like hurricanes. And moose lodges. And uncles who get drunk and moon the bridesmaids. It’s therefore pretty essential to ask your potential photographer to share a complete wedding with you. It’s the first question I would ask. Not only will it illustrate your photographer’s approach to the day, but it’ll illuminate so many other questions that might be swimming in your head, like: how many photos will you receive, are *all* your photos edited or just the photographer’s portfolio images, and whether the photographer is consistent throughout the day or just in a handful of highlights? 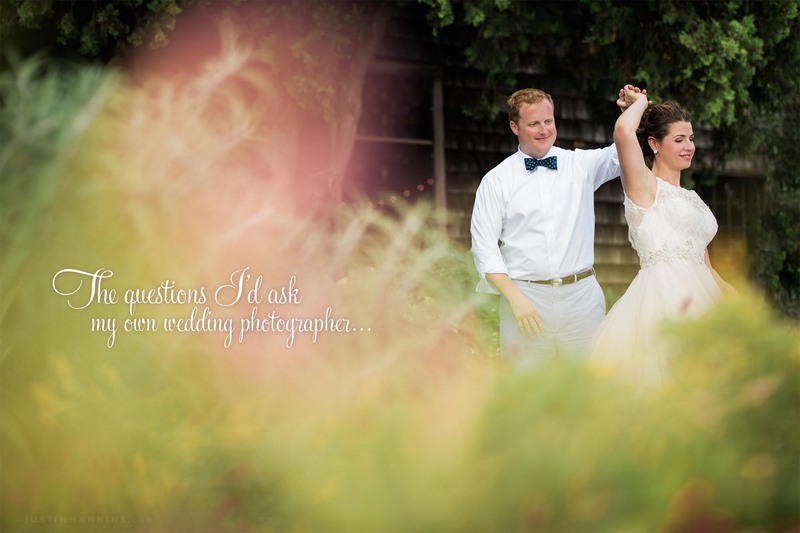 My approach: I’m ecstatic to share sample galleries! Get in touch and I’ll fix you right up. It’s nice to think everything will be puppy dogs and rainbows, but bad stuff happens to good people. And when bad stuff arises, you want to know that both your photographer and you are covered. What happens if your photographer breaks something at your church? Is your photographer at fault? Are you!? Moreover, what happens if someone steals your photographer’s gear from the reception space? Is the venue responsible? Are you? This is all stuff that hopefully won’t ever be an issue, but is imperative to think about just in case. There are 2 common types of insurance: equipment and liability. Equipment protects the photographer from anything that happens to his/her gear. Like if your grandma goes nuts about the paparazzi and tosses one of the photographer’s cameras off the balcony. Knowing your photog’s gear is covered means you won’t be picking up the pieces after your grandmother’s outburst. 🙂 Liability insurance protects things FROM your photographer. So if the photographer gets angry and shoves your grandma into the cake, knocking over your venue’s priceless collection of Fabergé eggs, the photographer’s liability insurance will kick in at that point. Note: A lot of venues require vendors to be insured and to submit a proof of insurance. I’ve worked plenty of weddings where uninsured vendors waited until the last minute and were barred from participating by the venue. If your venue requires insurance, make sure you verify that your prospective vendors are insured before you sign any contracts. My approach: I’m insured for both equipment and liability. And I promise not to shove your grandma into the cake. The irony is that these are the photos that end up appreciating most in value over time. As people age and as generations come and go, these photos are probably the most important photos you’re actually going to take. Therefore, the best approach is a strong will and sufficient preparation before-hand. If I were hiring a photographer, I’d want the assurance that a.) the photos would be fantastic and not suffer any decrease in quality simply because the photographer didn’t like taking group formals (hint: a lot of photographers despise this part of the day). And b.) that the photog could handle getting the photos done as soon as possible without sacrificing quality. My approach: from the moment we begin talking about your wedding, I work super hard to nurture our relationship and learn more about what to expect from your family and friends. Before your wedding, I reach out with a questionnaire that allows you to list all of the group formals that you’d like. (And I encourage you to ask parents because they’ll demand their own on the day-of, regardless of whether we’ve planned for them or not.) As a general rule, it takes 3-5 minutes per group. I take your list, rearrange it for optimal speed, learn as much as I can about your family, and then step in and take control when the moment calls. At all other times of the day, I’m rather quiet and hidden away. But when it comes to group formals, I get all up in there and crank that puppy through to ensure you get amazing photos of the most important people in your life… as efficiently as possible. Maybe this is an overprotective dude thing, but if it were my wedding, I’d want to ensure that whomever I picked could photograph my fiancée in a way that made her feel confident, beautiful and proud to share the photos with others. It’s one thing to dress up nicely and feel confident in the moment. But it’s another thing altogether to have someone photograph you for all of eternity in a way that documents that confidence and beauty in the most flattering way possible. My approach: Anybody can snap great photos here and there, but it really does take a special eye and experience to know how to photograph people of all shapes and sizes in a flattering way. As we work toward your wedding day, I pay attention to the subtle clues you give about your likes and dislikes. And on your wedding day, I think of my own loved ones as I’m producing your photos to make sure I’m giving you the best that I can offer. I hear horror stories all the time about crazy photographers. Some photographers are control-freak nightmares, sometimes they’re lazy and spend all day texting and eating cake, and sometimes they’re downright rude to people’s families and guests. Even if I were to fall in love with a photographer’s artwork, I’d want to ensure that having them play a role in our wedding would not cause unnecessary drama. After all, your photographer will be with you nearly every moment of the day — the last thing you want is someone who is difficult to be around. How would I evaluate a potential photographer? First, I’d read as much third-hand testimony from other people as possible. Yes, reviews are skewed toward the positive, as nobody really enjoys admitting they made a mistake (especially about their wedding). But if you read enough reviews, you start picking up on the subtle nuances that appear between the lines. When a reviewer discusses how a photographer made them feel, or shares anecdotes about how a photographer interacted with their family, it offers insight into the experience the photographer provides beyond the photographs. Next, I’d pay attention to my gut feeling when interacting with the photographer over email. This is someone who will play a significant role in my day, so if I find it hard to communicate with them or their replies are delayed or don’t answer my questions, I’ll be hesitant to ask them to join the team. Finally, if at all possible, I’d want to meet them either in-person or over Skype. Let’s be honest: just because someone can write blog posts well doesn’t mean they’ve got the best social skills. And weddings are pretty social! So I’d want to have at least one conversation with them to know that it’ll be easy to communicate with them in-person and that they’ll be able to take care of my needs on the wedding day. I’m a super-private person who doesn’t have a facebook account and hates the idea of photos of my loved ones and vulnerable moments shared all over the place. As a photographer, however, I know that being able to share images from my past weddings is absolutely critical to my own marketing/advertising needs. So I’d want to ensure my photographer and I were on the same page about publicizing my photographs after the fact. My approach: By default, I usually share images on my website and business social accounts, and occasionally enter them into competitions and print publications. And most recently, I typically only use people’s first initials when writing about their weddings. But as someone who prefers discretion, I will understandably address any concerns a couple might have about their images. The vast majority of people don’t have any concerns at all. Sometimes couples don’t wish to have identifiable photos of themselves online, but permit showing other decorations and details. Other times, couples have specific needs that require contractual agreements, like celebrities, couples in the military, government officials, and other public personas. I work with each couple on a case-by-case basis to ensure their preferences for discretion are taken care of. The industry average is 6-8 weeks, but even the most accomplished, well-known photographers exceed that. I’d definitely want to know some kind of ballpark for when I’d receive access to my images. My approach: Every wedding is returned within 4 weeks. Most packages offer faster turnaround. And expedited service may be added a la carte at any time. For the longest time I’d receive questions from prospective clients asking if *every* photo would be edited and ready for printing. “Of course, silly! Why would you have to ask that?” Welp! Turns out that plenty of photographers only edit the select few images that appear on his/her portfolio or inside the couple’s wedding album. Which is crazy to me. I’d be disappointed if only a fraction of my photos were ready for printing. My approach: Every single photo you receive will be edited by hand and optimized for printing. Every photo you receive from me (which is hundreds and hundreds and hundreds of them) will be of the same high quality as the photos that I use in my own portfolio and marketing. You’ll be able to purchase them through my own fantastic lab *or* take them to any lab of your choice to make your own reprints. Some photographers operate studios filled with associate photographers who get assigned on a per-wedding basis. If I fell in love with a photographer’s artwork, I’d want to guarantee that s/he would be the person actually photographing my wedding. And if not, I’d want to start this entire list over with the actual photographer who’d be assigned. My approach: I photograph every single wedding as the lead photographer. Sometimes I have assistant photographers supplement the day (e.g. if you’re getting ready simultaneously in two different locations). But I pick the photographers who work with me based on their ability to meet my own standards for both the quality of art and the quality of the experience they provide. Your wedding will be full of countless precious moments, from the excitement in your eyes when you first see each other, to your quiet whispers during your romantic first dance. Documenting these memories is an incredible honor, and I want to be part of the team that makes your night magical. Contact me today for pricing and availability.